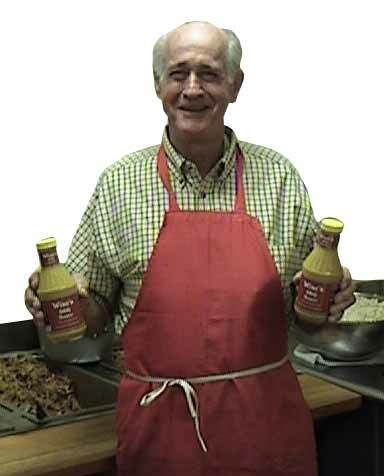 Wise's BBQ Sauce - Try Some Today! For many years, the Wise family has been cooking their special brand of BBQ for their friends and neighbors in Newberry, SC. And now, you can enjoy that special Wise taste at home, by cooking with Wise’s BBQ Sauce. Now, we know there are lots of BBQ sauce brands out there, many from huge corporate conglomerates and while we are sure these folks are doing the best they can, the fact is that store-bought, namebrand BBQ sauces can never match up to the authentic ingredients and taste of a fine homemade BBQ sauce. So what makes Wise’s different? Is it the years of refinement in getting just the right mix of spices and other ingredients? Or is it the care taken to make sure each batch of Wise’s BBQ sauce is just right? Every order is shipped free of charge right to your door. There are no extra charges, add-ons, or hidden fees. With Wise's the price you see is the price you pay. Not a significant source of cholesterol, sugars, vitamin C, calcium, and iron. Liquid margarine (liquid and partially hydrogenated soybean oil, water, salt, whey, soy lecithin, sodium benzoate [as a preservative], citric acid, artificial flavor, beta carotene, Vitamin A, palmitate), apple cider vinegar, water, distilled vinegar, ground mustard seed, salt, sugar, spices, turmeric, molasses, corn syrup, caramel color, garlic, tamarind, natural flavor.